Posted at 2:32 pm on October 28, 2012 by Lori Z. Leadership. 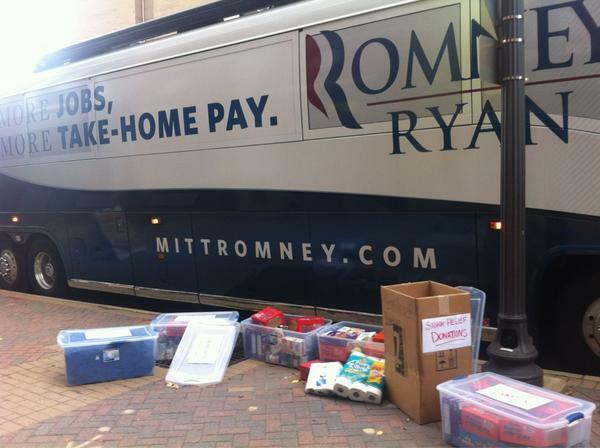 Team Romney announced that the campaign bus will be used to help with storm relief efforts on the East Coast, as Hurricane Sandy bears down. Goods are being brought to the bus already, according to this Twitter user’s on-scene photo. Kudos, Team Romney, for stepping up immediately to try to aid those in harm’s way. Our thoughts and prayers continue to be with all in the storm’s path.